This is a genus currently used for over 60 species of various host plant biologies and scattered all across the world. As a grad student I studied the few species occurring in North America and tried to understand better the species of the world. At the time, many species known from dicots and ferns were placed in Sitobion, and my work on this genus ended with removing many North American species from Sitobion to park them, hopefully temporarily, in Macrosiphum (see: Jensen, A.S. 1997. Redefinition of the aphid genus Sitobion Mordvilko (Hemiptera: Aphididae) based on cladistic analyses, with emphasis on North American species. Systematic Entomology 22: 333-344.). When looking at the whole world fauna, this genus is definitely still problematic and in need of serious study. Unfortunately, much original field work would be required, including difficult places such as sub-Saharan Africa. In North America I find only a few species, but in the West I quickly get confused about distinctions between Sitobion avenae and Sitobion fragariae when collecting in natural systems. Although I generally doubt it, I have even considered that the species Sitobion caricis (Glendenning) could be valid, representing aphids feeding on native sedges and grasses in the mountains. Much more study and field work would be required to resolve this fully. 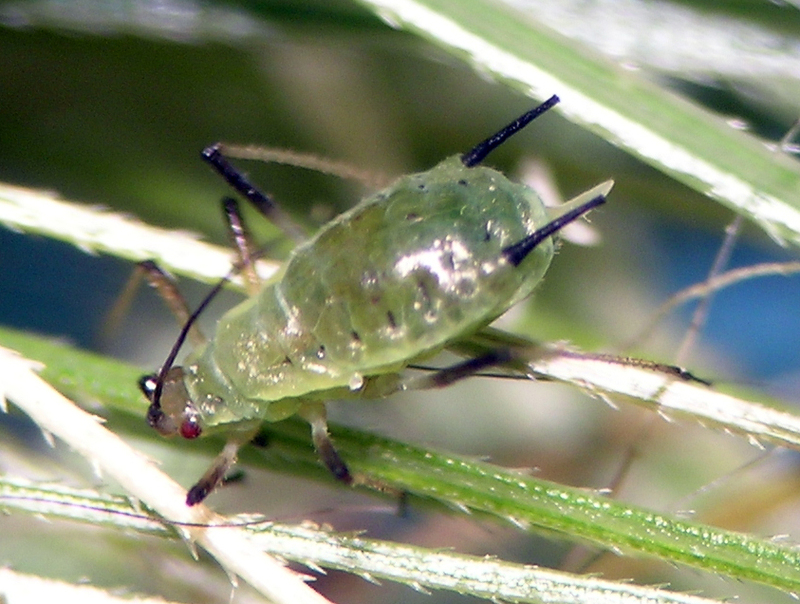 This is a pest aphid in grain crops such as wheat, and in my area is one of the most common wheat-feeding aphids. It occurs around most of the world, with a wide host range in Poaceae and many other monocots. In my region, it can sometimes be found on cattails (Typha) in and near agricultural systems in mid-summer. This is the only species of Sitobion of which I have a photo, and not a great one at that. Sitobion avenae from central Washington in June.